FODMAP is an acronym for Fermentable Oligo-, Di-, and Mono-saccharides And Polyols. (You can see why they went for the short version!). The FODMAP diet is more properly called the Low FODMAPs diet, because the idea is to limit your consumption of these nutrients. All of these nutrients are in the carbohydrate family; some are sugars (such as lactose and fructose), others are sugar alcohols (such as sorbitol and mannitol), and some are non-digestible fibers (such as fructans and galactans). All occur naturally in whole foods such as fruit, dairy, beans, and grains. Sugar alcohols are also used in more concentrated amounts in food processing to produce sugar-free and diabetic foods. Below are articles about FODMAP for further reading. Let’s look at the different types of fibre found in food and five ways to get more fibre in your diet each day. What are the different types of fibre found in food? Soluble fibre gets its name because it dissolves and thickens into a gel when it comes in contact with water. This means that food moves through the digestive system slower, which can help to lower cholesterol and help regulate blood glucose levels. (3) Soluble fibre is found in the fleshy parts of fruit and vegetables, seeds, nuts, lentils, oats, barley, psyllium, lentils and legumes. You might know insoluble fibre better by the name ‘roughage’. It is generally resistant to fermentation in the large intestine and helps bulk up and soften stools thereby assisting with regular bowel movements. (3) Insoluble fibre is found in the skins and seeds of fruit and vegetables, quinoa, wholegrains, millet and brown rice, as well as foods made with high-fibre ingredients such as cereals and wholemeal/wholegrain breads. Firm bananas, wholegrains, legumes all contain resistant starch. When rice, potatoes and pasta have been cooked and cooled, they also create resistant starch. Resistant starch is the name given to fibre that is not digested in the small intestine but travels into the large intestine where it is fermented by good bacteria which help keeps the large intestine healthy and may protect against bowel cancer. (3) This video from the CSIRO provides a great visual on how resistant starch benefits our gut microbiome and protect against cancer. Fruit is a source of fibre, just make sure you eat the skins on fruit (where appropriate of course – no one likes eating banana skin!) to get the insoluble fibre along with the soluble fibre of the flesh. If fruit contains fibre, then it is not surprising that vegetables are also great sources of fibre. Depending on the type of vegetable and how it has been cooked, vegetables contain soluble and insoluble fibre as well as resistant starch. Again, leaving the skins on veggies is a great way to boost the amount of fibre eaten. Grains generally contain insoluble fibre and resistant starch and include wheat, oats, rice, corn, barley, sorghum, rye, millet, spelt, freekeh, farro, kamut, amaranth, buckwheat and quinoa. All of the products in the Alpine range are a source of dietary fibre with the Spelt & Sprouted Grains and Tuscany Grain being good sources of dietary fibre (contains more than 4g per serve) and our Super Natural Protein bread being an excellent source of dietary fibre (contains more than 7g per serve). Legumes include foods such as chickpeas, lentils, mung beans, peanuts, tempeh, tofu, peas, soya beans, black beans, broad beans and baked beans. If you are following a low FODMAP diet, make sure you check your types of legumes and portion sizes carefully to ensure that you get the benefits of fibre without upsetting your tummy. Nuts make great snacks and therefore are an easy way to quickly increase your daily fibre intake. You also get the added bonus of healthy fats, protein, and phytochemicals (these are plant chemicals that have protective or disease preventive properties). 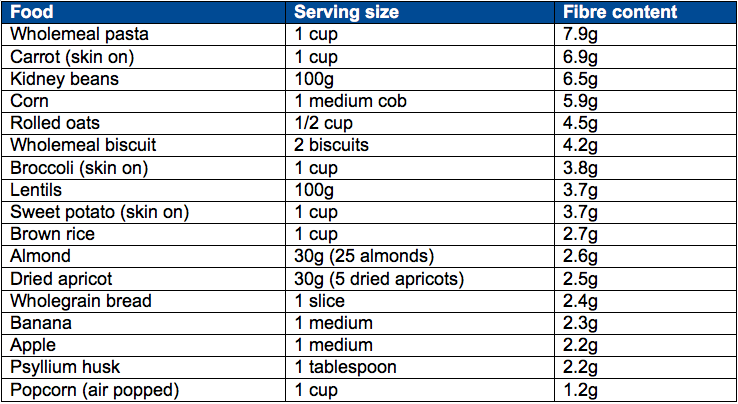 Like legumes, make sure you check your types and portion sizes if you are following a low FODMAP diet. By eating a wide range of wholefoods every day, hitting that daily fibre intake is possible, along with all of the fantastic health benefits dietary fibre provides. How do you get your fibre? The low FODMAP diet is a diet that was developed by an Accredited Practising Dietitian to help people manage their symptoms of Irritable Bowel Syndrome. It has also been extensively researched by scientists, so there is a lot of evidence to support its effectiveness. However, that hasn’t prevented people from misunderstanding what the diet involves and making up their own ‘rules’ or beliefs about it. So here are five of the more common myths about the low FODMAP diet…busted! At Alpine, we love our grains and our breads are packed full of them. But as well as making our bread taste extra good and give them great texture, did you know that they are also little nutrition powerhouses? Here’s why we think grains are so great. Note that the information here is of a general nature only. It has not been tailored for the low FODMAP or gluten free diets. Beginning a low FODMAP diet (the elimination phase) can be extremely daunting. The fact that it is called an ‘elimination’ phase suggests that there will be lots of food restriction. Not to mention that there is a LOT of information around telling you what you can and can’t eat during this phase. It can be tricky to know which information to trust. Everything can feel very overwhelming and leave you wondering if all you are going to be able to live on is air and water! Rather than focus on foods that you CAN’T eat, here are 9 foods that you might not have known you CAN eat during the elimination phase. All of the foods are considered to be low FODMAP based on the information found in the Monash University Low FODMAP app1. This app contains the most up to date information on foods suitable on the low FODMAP diet based on the research being done by Monash University. You should always refer to the app for the appropriate portion sizes of each food, as the amount of each food you eat is important during the elimination phase. Alpine Breads has launched a range of sourdough breads that have been endorsed by Australian FODMAP authority, Dr Sue Shepherd. Andrew Bertalli, the managing director of Alpine Breads, a fourth generation sourdough bakery in Benalla, Victoria, says it took years to develop its low FODMAP bread. After creating a highly successful form of fructose malabsorption diet in 1999 in her private dietetic practice, Sue Shepherd went on to become a member of the Monash University research team, led by Professor Peter Gibson, which developed the Low FODMAP Diet. Her PhD research and other studies she was involved in proved that FODMAPs could trigger symptoms of IBS, and in turn, limiting dietary FODMAPs is an effective treatment for people with symptoms of IBS in susceptible people. The low FODMAP diet has been published in international medical journals and is now accepted and recommended as one of the most effective dietary therapies for IBS. Abstracts of these articles are available in the links section of this website. The team at Monash University, including Dr Sue Shepherd, proved through her pioneering research that limiting dietary FODMAPs is an effective treatment for people with symptoms of IBS. The low FODMAP diet has been published in international medical journals and is now accepted and recommended as one of the most effective dietary therapies for IBS. Alpine Breads are the latest company with products to join the ranks of FODMAP Friendly foods!